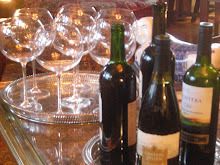 I wanted to share with you some of the tabletops in our English cottages. 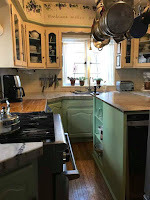 They were both decorated in what we think of as English Country Style. 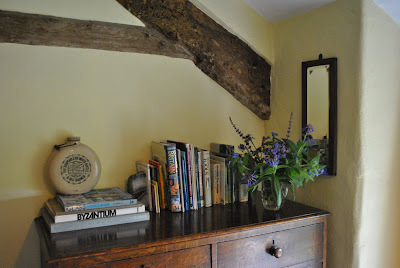 A delightful mix of old and new and things well loved and books and plants. 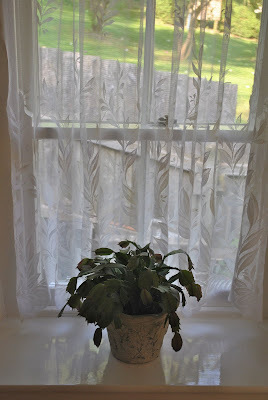 The window at the top of the stairs at Pitts Cottage. A simple lace curtain and a Christmas cactus -- one of only two windows on this side of the cottage. 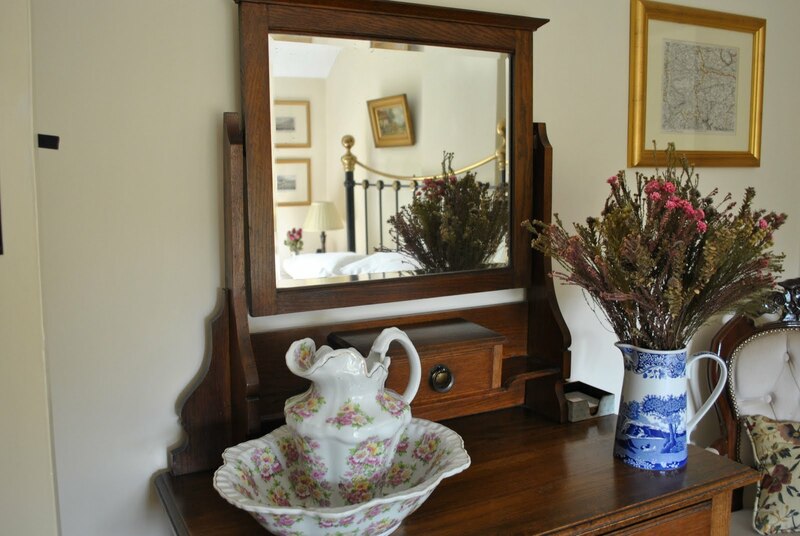 The master bedroom at Pitts Cottage -- a wonderful old chest, a rose patterned bowl and pitcher and a Spode Blue Italian pitcher filled with dried flowers including some lavender. 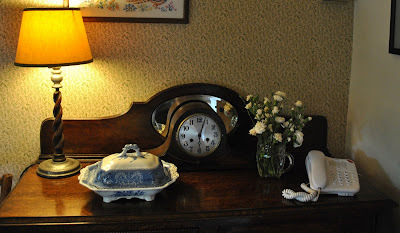 The buffet in the dining room at Blue Row -- an oak barley twist lamp, a delightful old clock, a Spode Camille blue and white tureen (mine!) and a bouquet of white carnations. This is my tabletop! For this buffet is normally the "hub" of Blue Row, with a book of information and the guest book and such. But I thought if I lived there permanently that the buffet would look like this!!! 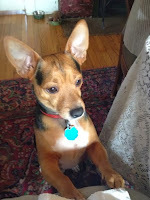 I'm joining Marty at A Stroll Thru Life for Tabletop Tuesday. 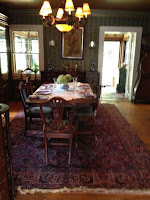 I can't think of better tabletops to share than the ones I lived with in England for the last month or so. We're heading home today -- and I will be glad to get home and back to Linderhof. It has been a trip of a lifetime but, alas, Linderhof is beckoning and I'm eager to be there. The tabletops are very pretty - I'm sure you're bringing fresh inspiration home with you from your wonderful month in Blue Cottage. Love the barley twist lamp! Thanks for sharing so much from England with us..loved every minute! Delightful tabletops, and just my style. I could enjoy looking at cottage decor all day long I think. Thank you gain for sharing your adventure with us. There isn't a tabletop more charming than those you have shared from your stay in England. Being an Anglophile myself, I am just floating as I take in what you have shown us! Just gorgeous! I love all your special treasures. Thanks so much for sharing! It isn't a butter dish -- it's a vegetable tureen -- and we're home and it made it home safely -- wrapped in bubble wrap and held in place with clothes!